A “self-portrait” of the Curiosity rover on Mars: a composite of several images taken with the rover’s Hand Lens Imager. The headlines are screaming it. NASA Mars rover discovers ‘building blocks’ for life: 3-billion-year-old organic matter, Curiosity Rover Finds Ancient ‘Building Blocks for Life’ on Mars, Building Blocks of Life Found on Mars, etc. etc. There’s only one problem. The building blocks of life were not found on Mars. I wish they had been. I think it would be awesome to find evidence of life on other planets besides earth. However, what NASA’s rover discovered on Mars wasn’t even close to the building blocks of life. Now, of course, I think the “3-billion-year-old mudstones” is scientifically irresponsible, but notice the difference between the scientific article’s title and the title of the articles written by “science journalists.” There is no mention of life in title of the scientific article. While organic chemicals are generally associated with living things, it is possible to make them from nonliving things…Scientists still use the terms “organic” and “inorganic” today to classify chemicals, but they do so based on the elements that make them up, not based on where they come from. There are four chemical building blocks of life: proteins, lipids, carbohydrates, and nucleic acids. Each of these can be recognized because they have identifiable functional groups: specific arrangements of elements that have defined chemical properties. Proteins, for example, are long chains of amino acids, and amino acids have two functional groups: an amine group and an acid group. Lipid are composed of glycerol and three fatty acids. Carbohydrates, the simplest of the building blocks, have carbon atoms as well as twice as many hydrogen atoms as oxygen atoms. Nucleic acids are composed of a nitrogen-containing base, a sugar, and a phosphate group. 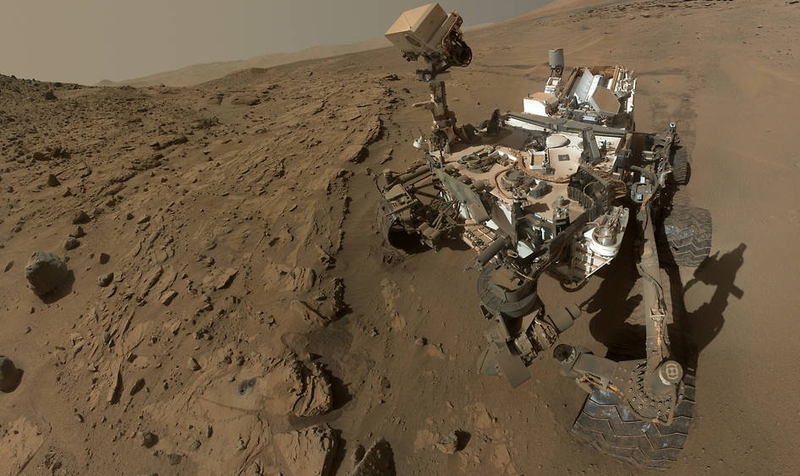 Did NASA’s curiosity rover find any of the functional groups that are found in the chemical building blocks of life? It might have found one. There might have been an acid group in the chemicals that were found on Mars, but that molecule could also be a chemical that has no acid group at all. The analysis that the rover is capable of doing cannot distinguish between the two. If course, there are acid groups in many organic compounds that have nothing to do with life, so the presence of an acid group tells us absolutely nothing. In addition, to be one of life’s building blocks, the acid group must be accompanied by an amine group. There were no amine groups discovered. The rover didn’t even find evidence of life’s simplest building blocks: carbohydrates. Organic matter preservation is central to understanding biological potential on Mars through time. Whether it holds a record of ancient life, is the food for extant life, or has existed in the absence of life, organic matter in martian materials holds chemical clues to planetary conditions and processes…[The rover’s] molecular observations do not clearly reveal the source of the organic matter in the Murray formation. Biological, geological, and meteoritic sources are all possible. Certainly, if ancient life was the organic source, then despite sulfur incorporation, the material has been altered sufficiently, such as by diagenesis or ionizing radiation, to obscure original molecular features more consistent with life (e.g., a greater diversity of molecules or patterns of limited structural variation within compound classes, such as hydrocarbon chains), or an insufficient amount of organic matter was deposited to allow detection…Our results suggest that it is likely that organic matter from various sources may be widely distributed in the martian rock record. Even if life was not a key contributor, meteoritic and igneous or hydrothermal sources have a strong potential to be broadly emplaced. Notice how the authors admit that the molecules don’t even have the characteristics you would expect from the building blocks of life, but that could be because they have been altered significantly since the time they were deposited. Why am I making a big deal of this? Isn’t the fact that organic molecules have been found on Mars surprising? Not really. Organic molecules have been found throughout the solar system, and we’ve known that for at least 30 years. So the very fact that this is being trumpeted as something “surprising” is irresponsible. More importantly, however, anyone who is interested in the chemistry associated with life needs to understand that there is a vast gulf between simple organic molecules such as what were found on Mars and even the very basic building blocks of life itself. Life’s chemistry is both amazing and complex, and to indicate that simple molecules like those found on Mars have any relation to the chemistry of life is grossly misleading. If there was once a thriving culture on Mars… how long do you think it would take until every last candy wrapper, skyscraper, and coke can returned to dust? Well, if it were a BACTERIAL culture, there wouldn’t be such remains! That’s an interesting scenario, John. It doesn’t track with the standard view of the evolution of the solar system, however. The standard view has the sun dimmer in the past and brighter now. Most astrophysicists think that Mars was only habitable for a few hundred million years, when the atmosphere was a bit thicker. That wouldn’t leave time for any “advanced” forms of life to evolve. Thank you for your clear explanation of what the study actually says. Headlines are misleading so often and cause all sorts of misunderstanding (or feed biases) since some (I would say many) people don’t even read beyond the headline. Why do you think it would be awesome to find evidence of life on other planets? That statement just grabbed my attention, and I would like to hear more. Thanks for the question, Julee. First, I love any new discovery, and life on another planet would be a new discovery. Second, it would present all sorts of mysteries that would need to be solved. For example, is it anything like life on this planet? If so, is it possible that it got transplanted from this planet? We know that bits of Mars have fallen on earth. Most likely, bits of earth have fallen on Mars. If a living organism managed to survive the travel through space, that would be amazing! Also, if that happened, how did it adapt to the harsh conditions on Mars? If it wasn’t transplanted from earth, then how is it different from life on earth? What does that tell us about how versatile life can be? These are all fascinating questions, but unless life is actually discovered on another planet, they are just fantasy. It all comes down to money. With the help of these purposefully misleading reports billions of dollars of your and my money can be justifiably appropriated for further research. Thanks for another great article Dr. Wile. What do you make of the cyclic nature of the methane concentration in the Martian atmosphere? It’s been measured over five-earth years and it’s apparently seasonally cyclic, increasing significantly in the Martian summer and decreasing in the Martian winter. Just wondering what your thoughts about that may be. Thanks again! Thanks, Bob! I appreciate all you do. First, I can’t say for sure that it really is cyclical. If you look at the actual graph, the error bars are pretty large, and there is a not insignificant chance that a horizontal line could explain the data. Yes, a the data do hint at a cyclic pattern, but it isn’t clear cut. Second, if it is cyclic, it probably has to do with methane being able to diffuse better out of warm rock than in does out of cool rock. I don’t see a cyclic pattern as being indicative of a biological origin at all. Thanks Jay. Appreciate that! Btw, we’ve been hecklin’ NASA everytime they claim that the presence of water (which is a relentless solvent to most “pre-biotic” compounds) is likely to produce life, as at rsr.org/abiogenesis. Another Unsuccessful Attempt to Detect Dark Matter Study Demonstrates that Most Animal Species Came Into Existence at the Same Time?